Deal Shopping Mama: Popcorn Factory EGGceptional Deal! 50% Off Easter Snack Assortment-$19.99!! Popcorn Factory EGGceptional Deal! 50% Off Easter Snack Assortment-$19.99!! Head over to The Popcorn Factory where you can score an EGGceptional deal! 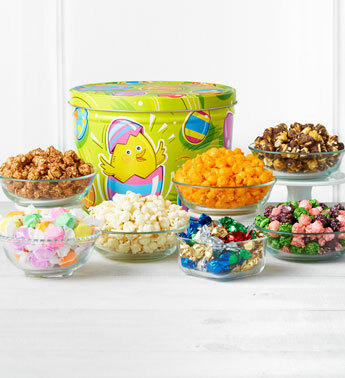 Pick up a 2 Gallon Easter snack assortment for only $19.99! This 2 gallon grand assortment tin is filled with a variety of yummy treats and gourment popcorn flavors! You can choose from five cute holiday tin designs all at 50% off! This offer expires on March 30, 2018! Head HERE and enjoy!! *UPDATE: TODAY ONLY (3/4/18) FREE SHIPPING ON POPCORN CANISTERS!! USE PROMO CODE-TINSFS! This promo code in not valid for the promotion above! Go here to go to site and take advantage of this deal!